This post is a review from the PES 2011 demo. In PES 2011, you can definitely feel an improvement in the game engine. The players are smaller, more proportionate to the field. The controls are sharper, you can feel more control in your passes. The power guages are now above the head of every player, and every single pass requires the use of the guage. There is less assistance from the AI on through passes, meaning you have to manually guage the direction and power required. You have to take more care in finding your target, and it also gives you the freedom to make unpredictable passes to your teammates making forward runs. I’ve played a couple of games, and after a few initial wayward passes, the passing moves look more realistic and helps in spraying passes through the smallest of gaps in defence. Crossing and shooting are generally unchanged in PES 2011. However, players are able to take shots from more angles and in tight situations. Improved animations and player intelligence allows players to make more snap shots and volleys, whereas in the past they will just ignore your commands. Players in PES 2011 are able to make more intelligent runs during the build up of your attack. After passing the ball, players will move forward into a good position to carry on the attack, instead of just dumbly charging forward to an offside position. You can produce interesting attacking moves with the pass and move options, leading to a satisfying team goal. Dribbling trickery in PES 2011 now requires the use of analog sticks. Directional buttons no longer perform tricks. Players perform tricks by pressing L2/LT and moving the right analog stick is a series of directions, similar to FIFA, which means we have to relearn the entire series of dribbling tricks all over again for PES 2011. However, there is always the Link Feint, which we will touch on soon. Diving is still present in PES 2011. This time, it is easier to execute the dive, by pressing LEFT and RIGHT analog stick together, though i believe it is still hard to convince the referee. Free kicks and corner kicks remain largely unchanged in PES 2011. I guess there’s nothing much for them to improve, but it seems most of your free kicks will appear to be just close to scoring, as long as your power is somewhere in the middle. Probably PES’s way of providing us with the ‘Ooooh’ moment. Are you asking about penalties? Well, I have not been awarded one yet so far, in the PES 2011 demo version. I did, however, tried out the system by conceding a penalty and changing sides to take the kick. And sadly, the system is still similar. Pressing down directional button and shoot, with accuracy and power determined by the duration you hold on to the buttons, without any form with visual guage. Well at least you can still apply your existing PES penalty skill. Throw in are now determined by a power guage too, which is very useful. Estimate the amount of power you need, and more often than now it leads to an accurate throw, be in a quick short one or a long ‘Rory Delap’ throw into the box. Goal keepers make less mistakes now, or at least in the few matches in the demo version. 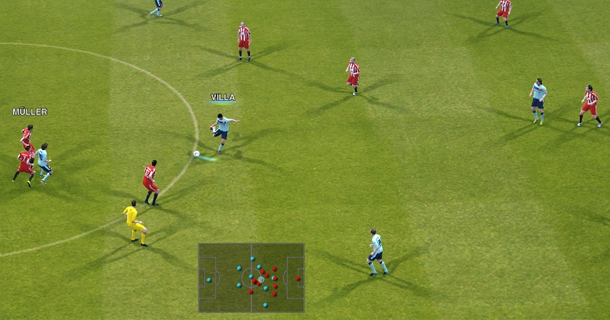 PES 2011 now employs a drag and move option with your controller, making it faster and more convenient to select your desired options, and moving your player into your preferred position in the field. 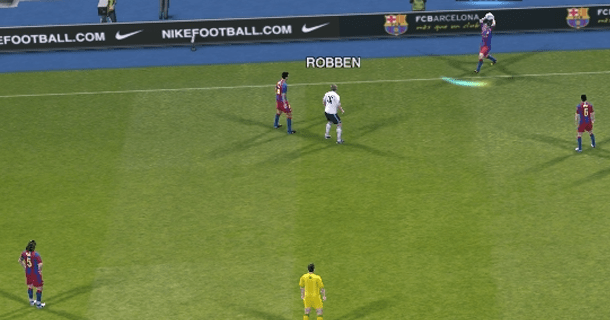 You can employ 1-touch option for gameplan, where AI chooses a suitable formation for you, or you go for manual, which i believe most of you will. In strategy, you assign preset strategies, which you can activate and deactivate mid-game by pressing ‘Select + Preset Buttons’. A few interesting ones. ‘Swap Wings’ – Where play is switched from one side to the other, to take advantage the unmarked opposite flank. ‘Long ball’ – Quick ball played from defender to striker. My favourate “CB Overlap” is still present. Under PES 2011 Team style, you change the settings for Player Support, Support range etc. However, the points are from 0 – 20, instead of the previous 0-100. Finally PES realised there is no need for 100 points when there are only 3 distinct settings for each slider options. 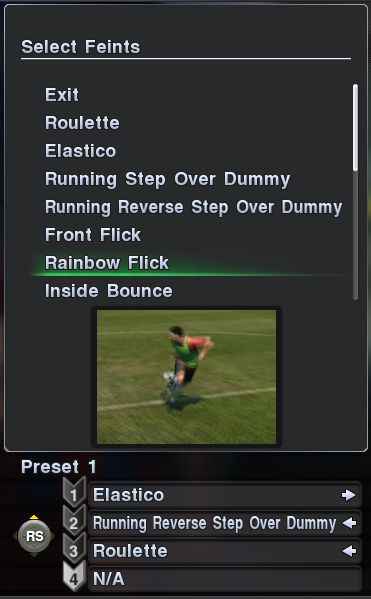 Link Feints – A new feature of PES 2011. You can have 4 Link feints. For each link feint, you pre-assign up to 4 dribbling feints, locked to 1 side of the right analog stick, e.g Right Stick UP. In the game, by pressing L1/ LT + Pushing Right Stick UP, your player will unleash all of the assigned tricks in sequence. You do not have to manually execute each of the tricks. Just watch your player perform…. Now the thing is, once you start, you cant stop, until the sequence is over, or when your player loses posession, or dribbles out of play. Thus, you have to choose your sequence carefully and use them appropiately at the right time, or else you might end up running straight into your opponent, or dribbling the ball out of play! 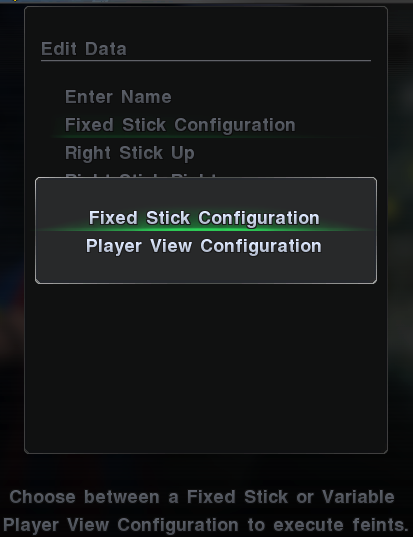 There are 2 settings for executing link feints, Fixed Stick Configuration, and Player View configuration. Fixed stick configuration means that for each time you push the Right stick Up, the same sequence is executed, regardless of where your player is facing. On player view configuratio, you assign feints relative to your dribblers view. For example, Link Feint A is assigned to player’s front. So, in the game, when your dribbler is facing left, to activate Link Feint A, you have to push Right Stick Left; when he is facing up, you have to push Right Stick Up to activate Link Feint. For me I prefer Fixed Stick configuration as I find it easier to remember the tricks. 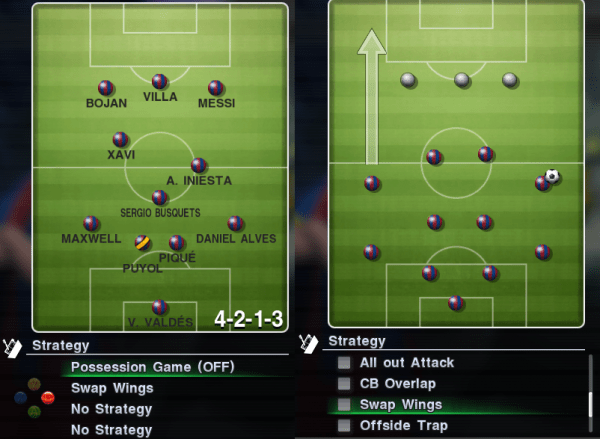 However, if you pre-assign tricks to specifically dribble past players when they are on the left of you, on the right of you, or straight ahead in front of you, a Player View Configuration may make your dribbling easier in PES 2011. Management Edit allows you to set orders before a match, at different time frames in a match, the gameplay strategy to utilise depending on the situation of the game. For example, when your team is trailing at from 45 to 60 min, your players will automatically adopt a ‘Quick Counter’ Mindset. When your team is leading towards the end of the match, your players will play ‘Possession Game’ to keep the ball and stall time. All these strategies are preset before the match, which saves you the trouble of tweaking whenever there is a change of scores. The hexagonal players stats diagram is back! And player skill cards are still present. PES players might need some time to get used to the new camera, which swings around the action to provide a more realistic broadcast view. The controlled passing is helpful for you to spot small gaps in defence and pick up players making intelligent runs into the box, but you will require more accuracy and a good guage of power. That said, I find that top players are very much easy and control, and majority of their passes are accurate, without much effort from me. All in all, PES 2011 feels more realistic than PES 2010. You have more freedom over your actions on the pitch, aided by much smarter AI teammates. PES 2011 is easy to pick up for PES veterans. After a couple of try out matches, and you should be recording victories with ease. The difficulty level has not increased by much. Seasoned players wil no doubt be online looking for challenges. As this is still the demo version, lets hope that minor bugs can be fixed, a few more improvements made, and the online competition be free of errors to ensure a more competitive and fairer challenge for all PES players. To see these PES 2011 Tricks in action, check out this short 8 min video! This post only briefly covers the main parts of PES 2011. There are various posts which goes more in depth into individual areas, such as crossing, shooting, and set pieces. Check them out under related posts below, or find them in the Game Plan category at the top of the page! Great read, thanks for taking your time and posting this! Hi there! Thanks! We are gonna need controllers to enjoy all the tricks in this version! Great site you got here. Very enjoyable to read all the articles. Hey, just found this site. Wanted you to know that there are people out there reading it and that your work is appreciated. I will try these out later tonight! very informative article, thanks for taking the time to post this article. Dont mention it, I enjoy this a lot! Hope you enjoy reading them too! Thanks! Really glad you guys like them! yo man, awesome job on with your articles, i already have your stuff bookmarked. all in all good job! And thanks for your feedback too regarding the link feint. Yes I think you are right. You can super cancel some of the moves, i received a similar comment in my link feint video on youtube. Thanks for confirming this fact! After making a pass, simply double tap R2, and the player who just made the pass will make a forward run. This is useful for creating attacking moves. thank you man..I am very much appreciated! Where is it preferable to place the defensive line? one the egde of the box? outside? inside? Usually I place in just outside the box. A deep defensive line might create too much space for attackers, while a high line will cause you to be vulnerable to through passes. 1) To do 1-2, after your player passes the ball, double tap R2(PS3) or RT(XBOX), and the player who made the pass will run forward. You can then pass the ball back to him. Alternatively, hold L1 or LB and press pass, and the player will run forward too. To return the ball, press through pass. I recommend the first method as it gives you more freedom. Haha you do not like the passing? I find that it gives me more accuracy and precision to make the through passes that splits the defence. Hey , I was wondering what the red,blue,yellow and green arrows above the players mean in the strategy management. The ones you see in your supplied video at 0:34. And also the green and blue bar below them. The arrows refer to the condition and form of the player, with RED being the best form. Thus you should always try to play players with RED Arrows. The green bar refers to the player’s “energy” level. The lower the green bar, the shorter he will be able to last in the next match. The blue bar refers to the fatigue level. A high blue bar means that the player will get tired easily in the next match. Also I am really frustrated with how to shoot properly in PES2011. Do you have any help on that? I know that if I aim down/up the ball goes to the left or right side of the goal and the more power the higher it goes; more likely to miss. However half of my shots miss and the ones that go in are not the most beatiful. They go half in the corner half through the middle. I want them to be tight into the corner. How do I aim for goal with perfection and take control over shooting? Hi, can you tell me when playing online how to load a Game Plan. In the options it gives me the option of loading 2 from Data Management, but how do I put my chosen team, players and formation into these two slots in the first place to be loaded when online? 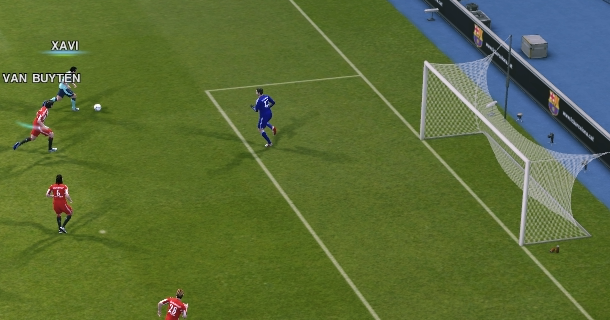 For some reason, I hate the AI in the player team when there is a ball I know it is going out the field but the AI still keep chasing the ball and the minute the AI touch the ball and it is out. Is there anything I can do? Also some critical time when I want the AI to follow with the ball or run the the spot that I am trying to pass to but the AI never goes there, and the opponent AI will get the ball, pretty sad. Yes you can do that. It is called ‘Super Cancel’. Hold R1 and R2 together. That will give you full control of your player when he is without the ball. By holding down both buttons, you can freely move your player with the directional buttons, overriding any stupid movements made by the AI. You can use this to stop your teammate from chasing after the loose ball, and even use it to block your opponents. Try it and let me know Kelvin! I am sorry, I don’t play online so I am not of much help to you. Perhaps any reader can assist? Most of the time I just do a simple tap on the ball, aiming for the far post. You can apply a slight curl to it, e.g Hold UP and LEFT, and release UP while holding down LEFT. This works better with top strikers. As for shots that goes into the corner, I think it is quite hard to guarantee that. However, for players who are in RED ARROW condition, their shots tend to be very powerful and have a high chance of beating the keeper. são poucas as vezes que ele chega na cara do gol e perde e eu chego varias vezes e quando naum chuto para fora sai fraco. De qualquer distancia que ele chuta vai no gol e eu posso tar cara a cara com o goleiro que tenho que virar o direcional todo para poder ir no canto, se puder em ajudar agradeço..
how to change difficalty level in PES 2011 because I want to play exibition matches? I’m playing PES 2011 on my Windows 7 mobile, and I love it! The only thing is, there is a feature that I don’t understand how to use, and I can’t find instructions for it anywhere on the game, or online. The feature I’m talking about is Formation Slots. 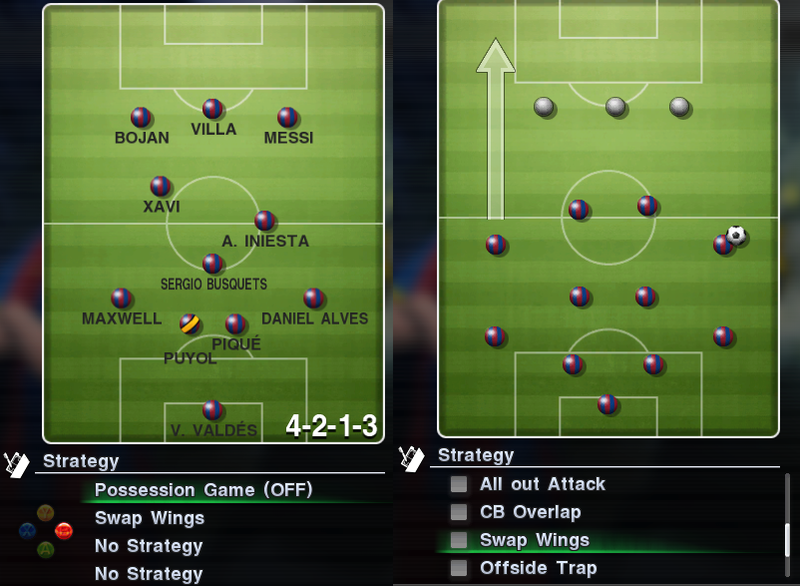 The game lets you select various formations, and it lets you either “Save” or “Load” that formation into any of three slots, marked ‘A’, ‘B’ and ‘C’. It’s clear how to “Save” or “Load” a formation. What’s not clear is what is actually being achieved by doing so. When do these formations actually get used? Can I do something during the game to activate one of the other? I know there is a little radar in the middle of the screen that lets me choose any of 5 strategies (full offense, half offense, center line, half defense and full defense), but, do any of these 5 strategies relate in any way to the 3 formations that I may or may not have saved? untuk menyusun kompetisi secara manual, misal piala eropa,liga champions atu yg lainnya …. kita tidak bisa menyusun Tim untuk tiap Grup secara manual tapi PES langsung mengisi tiap grup secara otomatis, bagaimana caranya ???? txs …. Hmm, it should be in the settings? You have to change it before the match or in the main menu. in settings in the main menu?